kornkorn87 Incense Spa Aroma Ocean Fragrance Cones Burner Holder Thai Scent Relax Sticks Ceramic Home Gift by kornkorn87 at Thai City Deals. Hurry! Limited time offer. Offer valid only while supplies last. Thai incese cone and stick spa aroma in your home. Have Ocean stick fragrance , mix sense for incense cone and include flower candle in the package. Thai incese cone and stick spa aroma in your home. 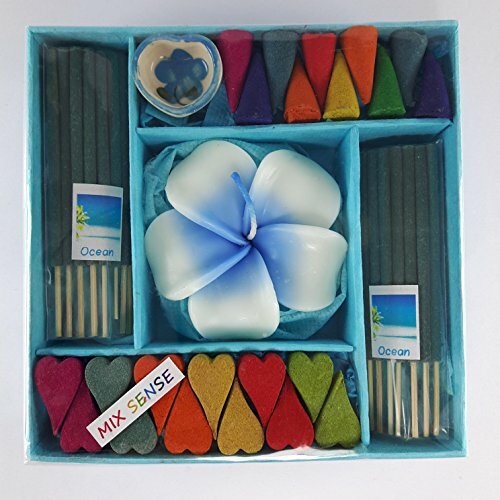 Have Ocean stick fragrance , mix sense for incense cone and include flower candle in the package. Good for gift oe use for special occasion , party. Good for gift and good for spa relax.